If the movement did not repeat France’s May 68 (which would have been impossible), it was and is in many respects a child of 68: a general protest against power, both political and economic; the refusal to organise into a party or under the banner of an exclusive ideology; the absence of political demands against the State; the political transgression of the borders which separate different spheres of life under capitalist alienation (“everything is political”, “the personal is political”, etc. ); the generalisation of direct action, horizontal self-management, autonomous forms of self-organisation; the creation and diffusion of spaces of autonomy, and so on. If 15M persists today, it does so not at the level of the spectacle, but in a semi-subterranean, almost clandestine manner, through the proliferation of spaces that may be imagined as moves in a Gramscian “war of position”. Crippled by crisis and rampant corruption, the Spanish authorities are consciously engaged in such a war, through the criminalisation of dissidence (e.g., fines, arrests), the incarceration of the politically disobedient for “sedition” (e.g. Catalonia) or for “disrespect of authority” (e.g. the rappers Pablo Hasél and Valtónyc), the hunt for anarchists (e.g. operations pandora, piñata, and the like), the eviction of occupied social centres … and the list goes on. And when all of this fails, or in conjunction with it, there is the violence and terror of the State. If we focus on just one such element, the eviction of occupied social centres, the police, invariably operating manu militari, have closed, throughout the country, over 50 since May 2011. Which is to say, that the social centres are not only among the many front-lines in the war, but that they play a fundamental political role in the creation of autonomies which the State has sought to destroy. And 15M is very much a part of what has intensified this struggle. Thus against the many closures during this period of time, a similar number of social centres have been defended (e.g. Barcelona’s Can Vies) and/or created. The war, in other words, continues apace. We share below a reflection on 15M, seven years on, by Carlos Taibo, originally published in the newspaper madrid15m nº 69, May 2018. They tell me that a few days ago, and in one of those talkshops that we so much have to bear, that the usual “experts” were interested in the trace of the French May 68. One of the participants was allowed to ask, in parallel, for their thoughts, even less clear, on the traces of another movement: the 15th of May, 2011. I suppose that, in relation to the latter, the most prudent thing is to take advantage of the mantra that suggests that we do not have enough perspective to evaluate what the legacy of 15M is. At the end of the day, the conclusion is that in 1975 [in the spanish context], seven years after the French May, a clear division of opinions was made with regards to the inheritance of the latter. And surely there was no shortage of those who professed to claim that the inheritance in question was little more than a handful of ingenious slogans. Today we know, however, that our vision of the world changed in 1968, and it did so to remind us that we are an indelible part of what we want to break down, in such a way that the principles and values of the enemy – we do not avoid this terminology – we carry them inside our head. Even with all of the precautions, it will be good to propose a brief reflection on what can be supposed to be the foundations of a future evaluation of 15M. The first thing I must point out is that concepts such as “legacy” or “inheritance” seem to refer to the trace of a movement that has already died. And it is urgent to stress that, even with its deficiencies and weaknesses, 15M exists. Many times I have said that in my opinion, and in the city in which this publication is published, it is still the spearhead of contestation in the neighborhoods. I know already that this statement can be read in two ways, since it also invites us to conclude that if the now very weakened May 15th movement remains, despite this, a main bulwark, it is a faithful illustration of what, in general terms, are the very low levels of mobilization that we have achieved. As things are, though, it never hurts to remember that the “15M option” remains open, in some cases because it is materially there and in others because it offers itself generously to anyone who wants to recover it. 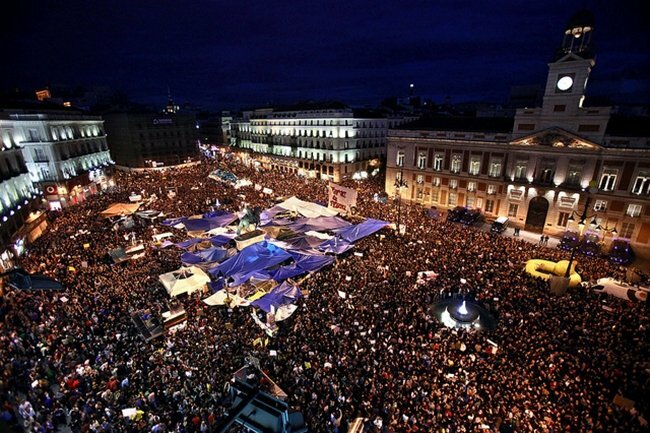 Another element, inescapable, in the scale, is called Podemos (and, with Podemos, the forces of “change”). The means of dis-communication have managed to strengthen the idea that Podemos constitutes the political realization – and with it the greater legacy – of 15M, in such a way that the latter, according to that perception, disappeared to make way for a much more relevant and efficient project. Although most of the time the people responsible for Podemos have tried to avoid the argument, the truth is that this dramatic distortion has trapped the perception of many people. If, on the other hand, it is true that the 15-M had lost steam long before the irruption of Podemos, it is necessary to attest that the latter has ostensibly been a demobilizing response to the demobilization. Beyond the above, it must be stated that Podemos, a political force that is traditional, hierarchical, personality centred, the bearer of a sordidly social-democratic statist proposal and, in short, manifestly removed from any perspective that smells of self-management and devoid of any consciousness of what it means to speak of the approaching collapse, is in many ways the literal antithesis of 15-M.
At times I have the impression, and I take another step here, that the trace of a movement like 15M is easier to be perceived through intangible elements than in the contest between material realities that, as things go, do little to inspire. To make myself clear, I believe that today it is much easier to talk about capitalism, patriarchal society, alienation and exploitation than it was before 2011. And I believe, also, that certain organisational practices that reflect a capacity for reaction did not exist, or were more modest, before that date. What I am saying does not mean, however, that material realities are absent, that when expressed, that they illustrate the contemporary vigor of what the movement aspired to. I have in mind in this regard, of course, the proliferation of autonomous spaces that, self-managed, de-commodified and, hopefully, depatriarchalized, have appeared among us. I suspect that the final balance of what 15M has been will depend to a large extent on the drift of those spaces and on the imprint that they leave, in the articulation of a general movement of contestation against capital and the State. I finish with an argument that invokes hope. The corrosion, increasingly visible, and perhaps irreversible, of all the institutions of power – and of those who participate in them – can not but cause a nostalgia for 15M that I appreciate in many people and places. It would be good if this nostalgia gave way to the reconstruction of a movement that, with that name or with another, logically has to worry more about the present than its unpredictable legacy for the future. This entry was posted in Commentary, News blog and tagged 15M, autonomy, Carlos Taibo, Okupations, revolution. Bookmark the permalink.